← DIY Brick Patio, walkway, fire pit. The Mug Root Beer Review was long-awaited. Mug root beer is the national Pepsi-co root beer. You can find it wherever Pepsi is available. Since it is such a large part of the national selection, it is only fitting that it would be an All-American beverage. It is… High Fructose Corn Syrup. Mug is the last national brand root beer to be reviewed by Handy Father. It is somewhat disappointing. It has no flavor that stands out, barring the HFCS. One reviewer tried to say that there is a slight vanilla flavor, but that is wishful thinking. If I had to pin down anything to say this root beer reminds me of, it would be the root beer barrel candy, but a weaker and less flavorful version. Because of the Nationwide Generic Flavor, we gave the Mug Root Beer Review a score of 2.25 out of 5 stars. Mug Root Beer Ingredients are easy to find anywhere, and all you need to know is that the only dominant flavor is high fructose corn syrup. 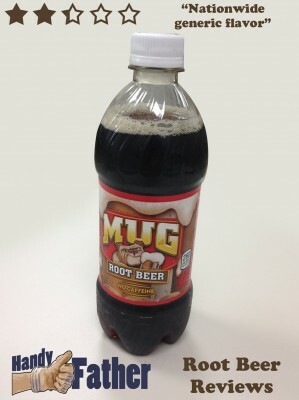 If Mug Root Beer is your favorite, then I implore you to visit the Root Beer Reviews page on this site, and try something else. Is Handy Father wrong? Tweet @handyfather, or leave a comment below, and tell us why.